Hear critical information for supporting prospective student-athletes. Learn about the academic requirements students must meet to be eligible, as well as the role of school counselors in the NCAA Eligibility Center process. Focus on the new SAT, online courses and the core-course review process. Download accompanying handouts here. 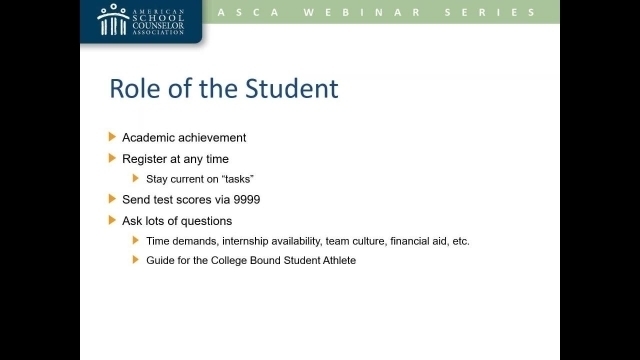 Explain the purpose of NCAA initial eligibility and its relationship with college readiness and success. Explain academic requirements students must meet to be eligible for NCAA athletics. Discuss the high school counselor's role in the process.